The NSM-205FCS (SC Connector; Single-mode) is a Unmanaged 4-Port Industrial Ethernet(10/100Base-TX) with Fiber (100Base-FX) Switch that secures data transmission by using fiber optic transmission to provide immunity from EMI/RFI interference. It is used Ethernet for transmitting a signal up to 15km, and is the perfect solution for applications where transmission must be protected from electrical exposure, surges, lightning or chemical corrosion. The NSM-205FCS operates at full duplex mode. In full duplex mode, range is 15km with 8.3/125, 8.7/125, 9/125 or 10/125 £gm fiber cables. 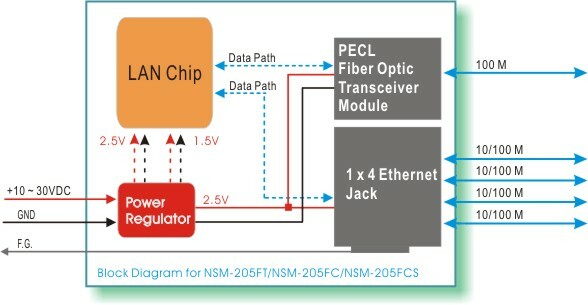 NSM-205FCS provides two power inputs that can be connected simultaneously to live DC power sources. If one of the power inputs fails, the other live source acts as a backup to automatically support the NSM-205FCS's power needs. DIN rail mount and Screw hole for wall mounting kit.